When Rachel Bertsche first moves to Chicago, she’s thrilled to finally share a zip code, let alone an apartment, with her boyfriend. But shortly after getting married, Bertsche realizes that her new life is missing one thing: friends. Sure, she has plenty of BFFs—in New York and San Francisco and Boston and Washington, D.C. Still, in her adopted hometown, there’s no one to call at the last minute for girl talk over brunch or a reality-TV marathon over a bottle of wine. 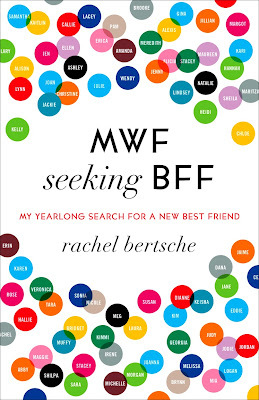 Taking matters into her own hands, Bertsche develops a plan: She’ll go on fifty-two friend-dates, one per week for a year, in hopes of meeting her new Best Friend Forever. I first spotted this book on the stands at Target, and I was intrigued by the concept. While I'm not quite a "newlywed" anymore, I really identified with the description on the back. There is this weird thing that I'm convinced happens to a lot of people after they graduate from college and start a job - it's like they are a little bit adrift in the world friend-wise. No matter how many friends they made in college, chances are high that they didn't all get jobs in the same city as you. In high school, you're surrounded by people your age and have a pool of people to choose from when making friends. The same thing goes for college - and you often have a larger selection and can make friends that will become even closer to you in that time. And then graduation. You toss the cap, turn the tassel, and show up for your first day of work. Maybe you're one of the few that ends up surrounded by people you are in exactly the same life stage as you. But most likely not. There might be one or two, but there will also be people all over the spectrum. And you don't go to work to make friends (although it's nice if you have friends at work). I give you all this background information to tell you that I was predisposed to like MWF Seeking BFF because it's the stage of life I'm in right now. And so, I hate to say that I was really disappointed by this book. I was expecting to read about Rachel's journey and feel like I could relate. Instead, I just felt incredibly put off by her. Here's the thing, even at before her 52 friend-date journey, Rachel had an active social life. She was in a book club, still talked to her best friend's from home, and ate lunch every day with the friends she made at work. It wasn't like she didn't have any friends - she just didn't have the specific kind of friend she wanted. Her attitude and description of the type of friend she did want just made me feel like she didn't appreciate the people in her life that she already had. I understand that maybe she hadn't met her best friend yet, but she certainly wasn't alone in the city. So, while some of her stories were funny, I was mostly frustrated by how many people she had right in front of her that she just dismissed as not being it. The whole thing seemed like it was more about the "concept" she wanted to write a book around rather than genuinely trying to meet new people. I don't want to say that she wasn't legitimately doing her best to make friends - it's just that everything seemed a little gimmicky. There were also a lot of research sections - like discussing studies that showed friendships's effect on your lifespan or things of that nature. And honestly, I mostly skipped that stuff. For a book that originally seemed like a memoir, the more analytical and overly detailed information about her research just didn't fit with the tone of the rest of the book. 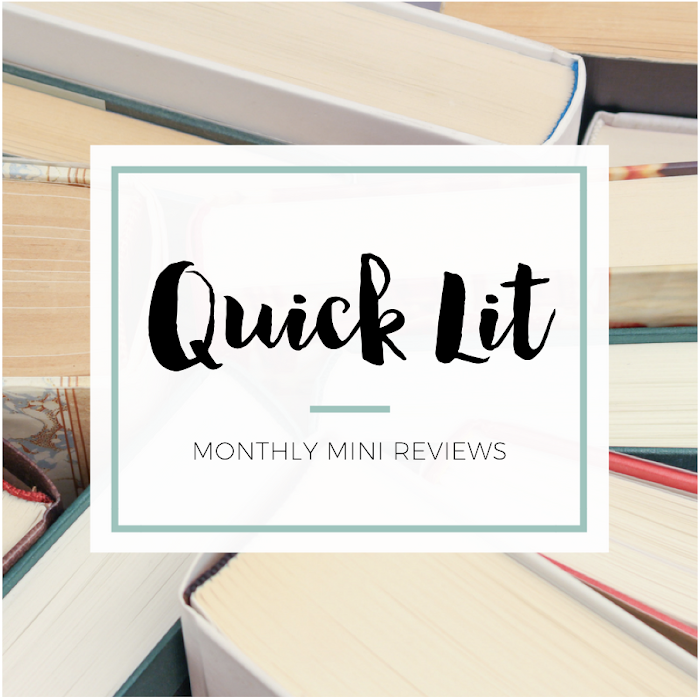 It felt so out of place and wasn't really woven into the book in a way that made sense. There'd be like pages of personal stories and then BAM! pages of studies and statistics. 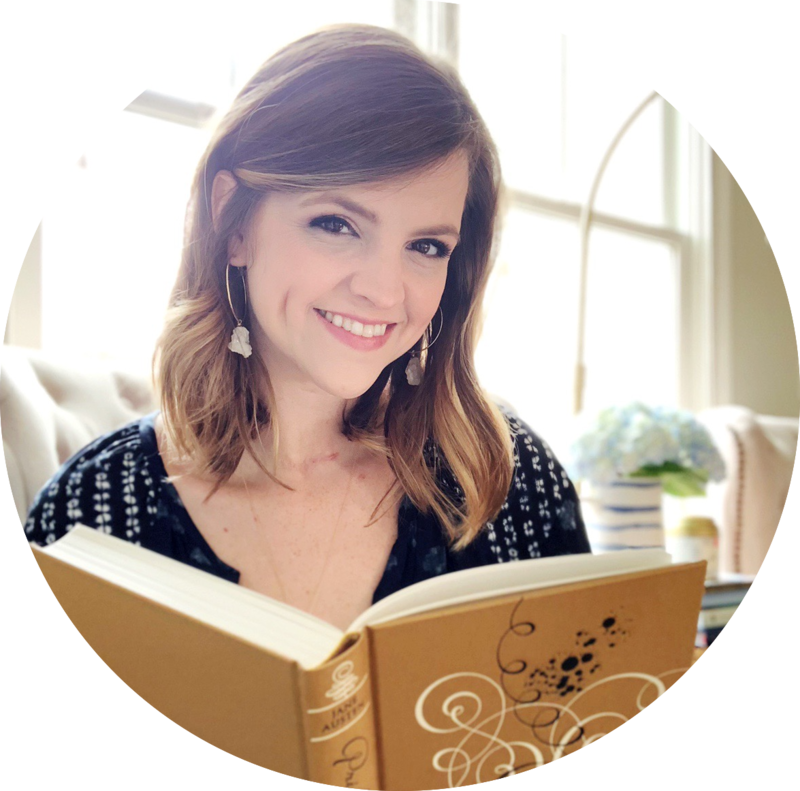 The thing I can say I liked about the book was that it really challenged me to think of new things I could do or places I could go to meet new people. If you do the same things every single day, you aren't going to get different results (aka meet new people). So I did like that it helped me realize that you actually have to be willing to put yourself out there (and possible get rejected) if you want to form lasting friendships. The best way I can think to describe my feelings on this book: like I showed up for a date with someone I met online and it turned out that their profile picture was from ten years ago... They may still be attractive now, but I'm still a little letdown that what I got wasn't what I'd been shown. "Popular culture has made it okay to yell 'I want a man!' from the rooftops, so why are we still embarrassed to say, 'I want a best friend'?" "The unfortunate truth is that we live in a society that's not only suspicious of people who declare they're looking for friends, but thinks friendliness in general must be qualified. We're worried that an overt show of camaraderie will be taken the wrong way." Great quotes. I'm sorry this didn't rock for you. I too have been wanting to read it. The older you get it seems the tougher it is to make friends. Thankfully it's easier to make friends with other mommies now that I'm a mom. Great honest review btw. Thanks Juju! I think this is more of a library read - get it from there first to see if you connect with it more. I'd really been looking forward to it and thought I'd love it since it's very much the stage of life I'm in right now. Glad you liked the review! Oooh, I am so disappointed to hear that this book was disappointing. I immediately bought it when it was released, but never got around to reading it. I definitely have lost touch with a lot a friends from high school and college, and was hoping to feel some hope from reading MWF. But the fact that she already had an active social life - that's really frustrating. Grrr. Anyway, thanks for the review. Honestly, I definitely say still read it if you own a copy because it did make me realize that I could be doing more to try and make friends. I did like that about the book - that it sparked some thoughts in my brain of what else I could do to meet people. But yeah, it was frustrating that she seemed like she didn't appreciate the people she already had in her life. ha, love how you described your feelings for this book! it sounds like an intriguing concept (I want to learn how to make friends!!) but I'm sorry it didn't actually live up to its potential. the research aspect of the book sounds off-putting too. thanks for your honest review! Haha glad you liked that description! I loved the concept so much, and I think that's why I was disappointed with parts of the execution. Just frustrating that it didn't live up to what I expected! And yes, the research parts were weird and off-putting. you know, i was really intrigued by the book's summary. i really, really was. i thought it was a fiction book, but then the mention of the stats and charts and research really turned me off. i think it could be such a great idea for a light-hearted adult book. this is really, really near and dear to my heart. i have gone through periods of my life where i've prayed so hard for friends that i connected with because i'd been burned by so many different people. i'm happy with where i am in life right now, but if this were a fictional book sans all the research, i would wholeheartedly pick it up purely because i could relate so well. great review, lady! Yeah, I know exactly what you mean about praying for friends because you've ben burned by so many different people. I think that's why I was really hoping this book would give me so insights into meeting new people and making friends. I expected to really relate to it, which is why it was so frustrating when there were so many things that made me feel disconnected from the book. But I do agree - I think a concept like this in a fiction book would be really interesting! Oh this is so interesting! I've not heard of this book but I can see the appeal of it. I am NOT in the same place as this gal. I have plenty of "mommy" friends but I want some friends that are, well, more like me outside of the mommy thing. (NOBODY JUDGE ME FOR THAT, OKAY?) My point is that I would've been interested in reading it to go about making friends too, even though I'm at a different place in life than the author. BUT it is sort of a bummer to see that she has people in her life in front of her (what a blessing, actually) and that she just has a specific profile she is trying to fit. Also with the charts and stats? Mmmmm. I think you may be onto something when you mention that this seems to be a concept idea for a book rather than a life experience. Such a bummer. Sounded so great when I was reading the summary! I know - didn't the summary sound so awesome?! I was hoping for so much from this book, and I just felt really frustrated at the way it felt like a concept she was executing rather than being real and relatable. Definitely a bummer! Ugh, so disappointing. The summary does sound utterly fantastic because like you, I am in that same place in my life. I mean, I am not maarried or anything but I am graduated from college. I didn't move very far from where I went to school -- about 15 minutes, however, most of my friends live at home where I grew up so 45 minutes or the college ones are spread all over the state. So yeah, it just seems like there is so much potential in this and potential to relate, and honestly if I was to read it, I'd probably have the same reaction as you and get annoyed that she didn't appreciate the people she already had. So glad you can relate to that place in life - AND that you know exactly what I mean when I say that certain aspects of this book really bothered me. There was SO much potential, and I just hated that it didn't seem totally genuine or relatable. It got real old, real fast. My BFF had told me about this book, and I thought it sounded interesting. However, I don't think I like that it feels more like she just wanted to write a book rather than actually find that perfect friend. Hm, I may pass on this one. Thanks for the honest review! It was definitely an interesting concept - one that I really wanted to love! If your friend enjoyed the book, then you can always give it a try. The things that stood out to me may not hinder your enjoyment of the book. If you're on the fence, though, I'd definitely recommend checking it out from the library. The book is divided into seasons, so you could always read the first "season" and evaluate how you feel about it. That will give you a pretty good feel for the rest of the book. Oh man, I was very curious about this one when I initially heard of it! It makes me sad that it doesn't read too much like a memoir, or so I gather from your review. I think I would probably feel very much the same way about her and her friends, since I always think it's important to appreciate all the people you have in your life. Yeah, I was so curious based on the summary! And yes, it doesn't really read like a memoir! It has the feel of someone recounting events, but it's more forced than natural. And yes, I think you'd probably feel the same way about some of her complaints about the people in her life not being the right kind of friends. That was really frustrating to me!